The Huh? : But What About Second Winter Part 2: Elevenses. 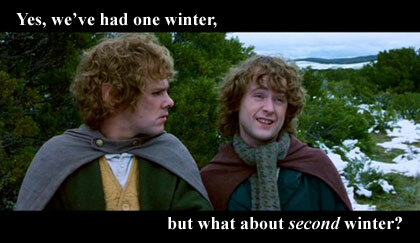 Once again we Minnesotans are subjected to ridiculous weather. We went from summer, to fall, then to winter, and spring, then winter, then spring, winter, and spring, and now we are somehow back in winter again with all the vast amount of snow Mother Nature feels like burying us in. 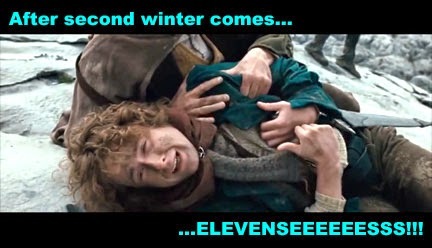 Well, I made the second winter meme before it was cool, and now have made a follow up to go with the quote I was using in the first one- this time it's about Elevenses, which naturally comes after second breakfast. I have to say, after returning to winter once more, I am really getting sick of having to shovel my way out of the house.